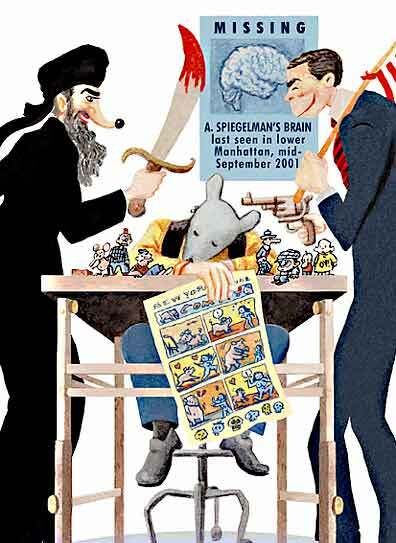 Art Spiegelman’s serialized 9/11 cartoon strip, “In the Shadow Of No Towers.” is about to be released in book form. The author of Maus, the graphic novel about the Holocaust, has again used the comic form to express, and work through, his own reactions to the terror attacks and the political aftermath. Spiegelman lives close to ground zero, and he spent a good part of 9/11 searching for his daughter, who attended school close to the Trade Centers. “In the Shadow Of No Towers” was commissioned by the Germanpaper, Die Zeit. Serialized over 10 episodes, it was published domestically by the New York Jewish magazine, The Forward, as well as by La Repubblica in Italy, De Standaard in Belgium, and the London Review of Books (episode 1&2 sample link; episode 3 sample link). To see Speigelman’s powerful New Yorker cover following the Trade Center attacks, go here.